Protective eyewear sold in the European Union must be CE marked in accordance with the PPE Directive 89/686. The process to achieve certification to this directive involves testing the eyewear mainly against the requirements of EN 166:2001 but other standards can apply depending on the application (see table 1). The PPE Directive applies also to sunglasses, even those sold for private or leisure use, and it can apply to prescription eyewear if that eyewear also includes protective features. It is also worth pointing out that the requirements and test methods for sunglasses (EN 1836) are in fact very similar to those for basic filtering eyewear covered by EN 166 and EN 172. However, for eyewear intended to be used as PPE in the workplace the key standard generally is EN 166. This article describes some of the requirements and associated tests which EN 166 applies to protective eyewear. EN 166 specifies the minimum requirements for a range of performance tests and these will be described in detail. It is important to note that not all of the requirements in EN 166 are mandatory. 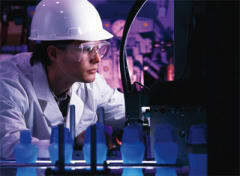 There is a basic set of tests which must be carried out on all protective eyewear of all types (e.g. spectacles, goggles and face shields) and a further set of tests referred to in EN 166 as particular requirements which must be applied if certain end-uses are envisaged for the eyewear or if the manufacturer wishes to make additional claims regarding protection. Finally, there are some optional tests which the manufacturer is free to apply or not. The basic tests, those considered as mandatory under all circumstances, include field of vision, optical transmission and diffusion tests, robustness tests, resistance to ageing, stability to heat, resistance to UV, resistance to corrosion and resistance to ignition. The main purpose of the field of vision, optical, transmission and diffusion tests and resistance to UV tests is to ensure that the eyewear does not impede or distort the vision of the wearer. The field of vision test in particular is intended to ensure that nothing in the frame or the periphery of the oculars impedes vision. The optical tests measure any tendency for the oculars to distort the view of the wearer. The spherical and astigmatic refractive powers are measured by viewing a target through a telescope, with the test ocular placed between the object lens of the telescope and the target. The test operative sets up the focussing of the telescope so that he can view the target clearly with no test ocular in place. With the test ocular in place, assuming the vertical and horizontal bars of the target go out of focus, the adjustments made to the telescope to bring first the horizontal and next the vertical bars successively into focus are noted. The change in the focussing power of the telescope to make these adjustments is directly related to the refractive and astigmatic power of the test ocular. The prismatic power of the eyewear is determined using a different method. Two beams of light are set up to converge on a target. The test eyewear is placed in these beams so that the beams pass through the centre of the oculars. Any horizontal and vertical deflection of the two beams from the original convergent point on the target is recorded. The horizontal and vertical prismatic differences are calculated from these measures of deflection. Clearly in the above tests the optical powers should be as neutral as possible in order that the eyewear does not create any unintended hazard. Any tendency for eyewear to create a diffusing effect should also be minimised. The diffusion test measures this property. A laser beam is directed in turn through a circular, then an annular mask, towards a light detector. The level of light detected is recorded for both masks. With the test ocular in the path of the beam at a point before the beam passes through the masks the measurements are repeated. The transmission test measures the percentage of incident light which the test oculars transmit to the wearer’s eyes. No universal requirement for transmission exists because for some situations clear oculars with near 100% transmission are required. On the other hand other circumstances might require that the oculars limit or filter the light passing through by reducing the overall amount of light and also by reducing the transmittance of a specific wavelength range such as ultraviolet. For clear oculars any test device which produces an overall percentage transmission value across the complete visible spectrum is satisfactory. Specific requirements for transmission for any eyewear which has a filtering action will be found in one of the specific standards listed in table 1. For example EN 170 is intended for wearers who are exposed to ultraviolet light during their work. The requirements in standards such as EN 170 and 172 are somewhat more detailed than EN 166. The maximum transmittance is specified for certain parts of the visible and ultraviolet spectrum. For example, in EN 170 the maximum percentage transmission of light permitted in the UV-A part of the ultraviolet spectrum (i.e. between 365 to 313 nm) varies between 10% and 0.8% depending on the basic transmittance. So for an ocular which has a luminous transmittance of 75% the maximum transmission in this range is 10%. However, the maximum transmittance in the UV-B and UV-C ranges (below 313 nm) is 0.00003%. Although not listed as an optical test, the resistance to UV test can have an effect on the diffusion and transmission properties therefore these are re-tested after UV exposure. To meet the EN 166 requirements there are limits on the change in the transmission and diffusion results for the test eyewear. A further requirement of eyewear, particularly filtering eyewear, is that the level of transmittance is substantially constant across the viewing area of the ocular. The final test within the optical category is for assessing the quality of the materials and surface. SATRA utilises a light box fitted with polarising filters through which to view the illuminated sample. Defects likely to impair vision can be easily spotted using such equipment. Apart from exposure to UV the mandatory non-optical tests include robustness tests, resistance to ageing, resistance to ignition and corrosion. The minimum robustness test involves resting a static load (10 kg mass) on the ocular. The ocular must not sustain any damage which results in cracking through the entire thickness into one or more pieces or if a fragment of 5 mg or more becomes detached from the inside face. Substantial deformation of the ocular is also not permitted. This test is only applicable to cover plates or to filtering oculars. The enhanced robustness test can be used on complete eye protectors and involves dropping a steel ball onto the eyewear. For complete eyewear the test is carried out with it mounted on a headform which is marked with the centres of the pupils and the lateral protection points. As with the minimum robustness test, the ocular must resist substantial deformation, cracking into two of more pieces, or loss of fragments of 5 mg or greater. The frame must also resist breaking into two or more pieces or breaking such that the oculars are no longer contained. Stability to elevated temperatures is tested by exposing the eyewear to a raised temperature. After the test the eyewear is examined for deformation. Corrosion testing involves placing the eyewear into a salt solution and afterwards assessing any metal parts for corrosion. The ignition test involves heating a steel rod to a temperature of 650°C and allowing the end of it to come into contact for 10 seconds with all external surfaces of the eyewear. No ignition of any part of the eyewear is permitted and no part of the eyewear is permitted to glow after removal of the steel rod. There are a number of requirements for protection against specific hazards such as high speed particles or resistance to fogging. These are required only if the eyewear is intended or claimed to offer such protection. If the eyewear meets the specific requirements then either the ocular or the frame or both, depending on the requirement, will need to carry a specific code. Table 2 shows the marking codes for frames and oculars depending on the hazard. Note should be taken of the fact there are some tests in the above table which are not suitable for all eyewear types. For example under the Particular and Optional requirements in the above table, the only valid tests for spectacles are those where the marking symbol is a letter e.g. K-Resistance to surface damage by fine particles test, N-Fogging, R-Enhanced infra-red reflectance, S-Enhanced robustness and F-Low energy impact. Categories B and A (Medium and High energy impact are not permitted for spectacles). Spectacles cannot claim protection against liquid splashes, large dust particles, etc. because they are inherently unable to protect against certain hazards. As the name suggests the resistance to surface damage test assesses the ability of the oculars or lens to resist damages by fine abrasive particles -in this case sand. After exposure to the abradant the diffusion test is repeated on the ocular. Any surface damage which occurred would result in raised diffusion levels. In the fogging test, the surface of the ocular is exposed to a very humid atmosphere above a heated water bath. If oculars are without an anti-fog (or anti-mist) coating, condensation usually occurs within one or two seconds of the exposure starting. Any ocular which resists the formation of condensation for greater than 8 seconds is regarded as being anti-fog. Like the enhanced robustness test, the resistance to high speed particle test is carried out on complete eyewear and tests both the oculars and the frame. The ”particle” used for these tests is a 6 mm diameter steel ball bearing weighing 0.86 g. The low energy impacts (speed - 45 m/s) can be carried out on all types of protective eyewear but the medium energy impact (speed - 120 m/s) can only be carried out on goggles and face-shields. The high energy impact test (speed - 190 m/s) is only carried out on face-shields. This test is usually carried out with the samples at ambient temperatures but can be carried out on samples exposed to extreme temperatures. In this version of the test the eyewear is impact tested after conditioning at 55°C and -5°C. The criteria for passing or failing in the high speed impact test are the same as for Enhanced Robustness. Ignition testing is part of the basic requirements but for more extreme environments two tests are provided. One of these assesses the resistance of protective eyewear to an electric arc hazard. The other assesses resistance of protective eyewear to contacting hot solids. The test involves bringing an object at 900°C in contact with the eyewear (the temperature in the basic ignition test is only 650°C). All protective eyewear sold within Europe must be CE marked according to the European PPE Directive. The majority of protective eyewear spectacles will be within the intermediate category of PPE requiring both testing and also inspection of the technical file by a notified body before a type examination certificate can be issued. Eyewear protecting against certain hazards such as chemicals, would be regarded as complex category PPE and in addition to testing the type examination, the production of such eyewear must be subjected to regular tests or audits by a notified body such as SATRA. SATRA is a leading authority on international legislation and testing, and the technical aspects of a wide range of consumer products including footwear, leathergoods, apparel, toys, safety products, furniture, floorcoverings, construction products, and homeware. Many of its test methods become industry standards and its production efficiency and accreditation systems are unrivalled. It also houses a well equipped chemical analysis laboratory to meet the global demand for restricted substances testing.